This leaf is from a Book of Hours made in France in the later fifteenth century, and its text conforms very clearly to the Use of Paris. 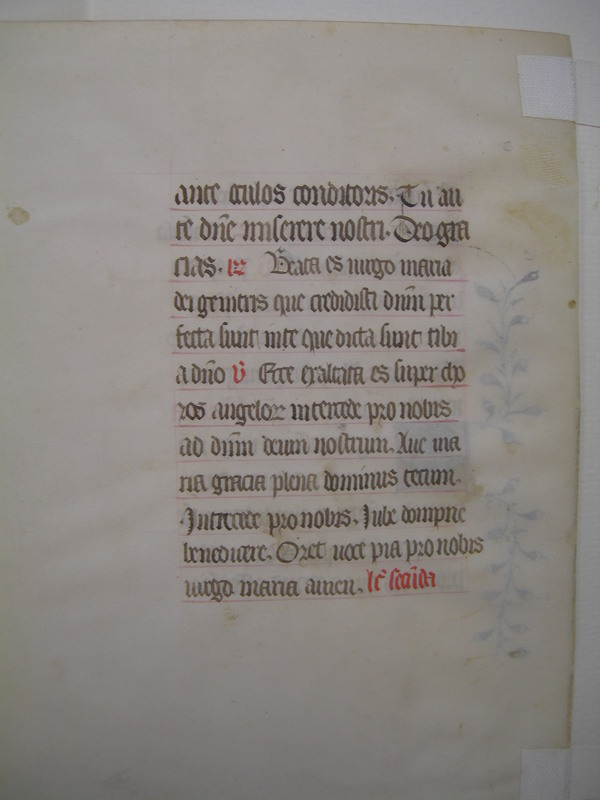 The vellum is very well prepared, and measures 18.5 x 13 cm; the text block is ruled in red, and the main ink is a dark slate color. The formation of the letters, both in shape and in position above the ruling, gives them a slightly insubstantial quality; there are, moreover, a surprising number of grammatical and other scribal errors in these leaves. Simple vines of red, blue, and gold flower buds ascend and descend from at least one large initial on each leaf; the blue ink used for the decoration is especially vivid. See Denison University Leaf 45 for more information about this manuscript. Text: Based on the leaves we have seen, this Book of Hours accords with the Use of Paris: the leaves in the Ohio State University and Cleveland Institute of Art portfolios provide the best clues. 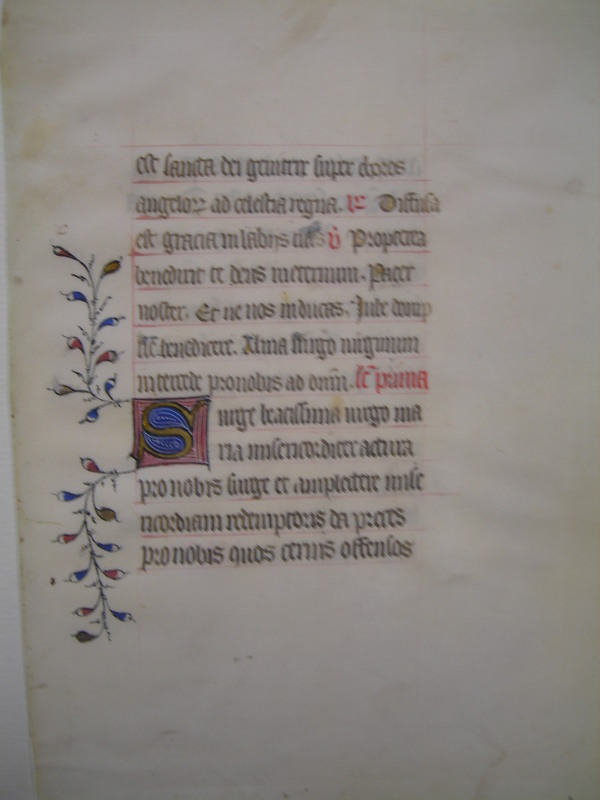 This leaf contains text from the Hours of the Virgin at Matins. est sancta dei genitrix super choros angelorum ad celestia regna. V. Diffusa est gracia in labiis tuas. R. Propterea benedixit te deus in eternum. Pater noster. Et ne nos. inducas. Jube [ ]. Alma virgo virginum intercede pro nobis ad dominum. Lectio prima. ante oculos conditoris. Tu autem Domine miserere nostri. R. Beata es virgo Maria dei genitris que credidisti dominum perfecta sunt in te que dicta sunt tibi a domino. V. Ecce exaltata es super choros angelorum intercede pro nobis ad dominum deum nostrum. Ave Maria gracia plena dominus tecum. Intercede pro nobis. Jube dominus pro benedicere. Oret voce pia pro nobis virgo Maria. Amen. Lectio secunda.